There’s life in the Devon market yet, observes Martin Lamb of Savills in Exeter, as an influx of buyers from the South-East gives a shot of adrenalin to the country-house market in England’s second-largest county. Buyers come to Devon for all sorts of reasons-the shooting and fishing, the sailing, the schools, the scenery and the wide-open spaces-but, these days, they’ll also find that a million or two goes a long way down here. Ease of access from London by road and rail makes the fast-growing city of Exeter a natural staging post for families who need to retain their links with the capital. Closer still, via junction 27 of the M5, is the former wool town of Tiverton, home to the celebrated Blundell’s School, founded in 1604 by rich local wool merchant John Greenway. Buyers who’ve done their homework will know that families living within a 10-mile catchment area are entitled to a discount on school fees, which only adds to the attractions of idyllic Bradleigh House at Templeton, four miles from Tiverton for sale through Savills (01392 455755) at a guide price of £1.75 million. Set in 38 acres of gardens, paddocks and woodland, with views across rolling hills to the Exe valley, immaculate seven-bedroom Bradleigh House features a courtyard of out-buildings, an indoor swimming pool, a stable yard and an all-weather manège. Devon heaven for fishermen and prospective Blundell’s parents is Holmingham Farm at Bampton, eight miles from Tiverton, also for sale through Savills, at a guide price of £1.5m. Set in 120 acres of pasture and woodland on a bend of the River Exe, the West Country’s most prolific salmon river, Holmingham Farm has an old-fashioned,five-bedroom stone farmhouse, plus outbuildings and 1,300 yards of mainly double-bank fishing. It’s offered as a whole or in four lots. Strutt and Parker (01392 215631) are selling the beautifully renovated Victorian Yellam Farmhouse (pictured) and its three-bedroom Yellam Cottage, set in two acres of grounds near the fashionable moorland town of Chagford, 17 miles west of Exeter. A guide price of £1.5m is quoted for the stone-built, four-bedroom main house, which has glorious views over Chagford and the surrounding countryside; its second-floor office suite could be converted to further bedrooms if required. Outbuildings include barns, storage and stabling, and a detached roundhouse that could also be converted, subject to the necessary planning consents. The market for coastal houses in Devon appeared to take a dip earlier this year, due to a shortage of high-profile houses for sale, but it never really went away. 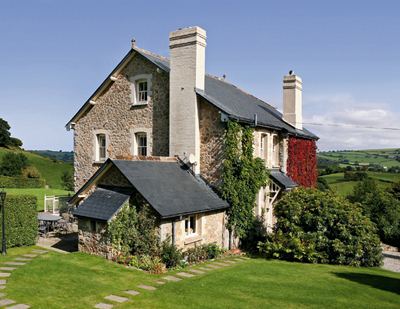 Having sold tranquil Chad Wyche near Chagford within 11 days of its launch on the market at a guide price of £1.295m in July, local agents Rendells saw their happy vendors buy a substantial detached house near the Regency resort of Sidmouth, east Devon, for exactly the same price, through fellow Devon agents Harrison-Lavers & Potbury’s. That bodes well for the sale of elegant Georgian Nickleby House in the shadow of Budleigh Salterton’s famous red cliffs, through Knight Frank (01392 423111) at a guide price of £1.55m. Built in 1798 and listed Grade II, the 5,067sq ft, four-storey, brick-built town house has been impressively renovated throughout, and has four fine reception rooms, a kitchen/breakfast room, five bedrooms and four bathrooms, with space for a separate apartment on the lower-ground floor. The enduring popularity of Torquay dates from the early 1800s, when the Napoleonic Wars prevented well-off Victorians from holidaying in Europe. Later, many would build large family villas on the hill overlooking the town, of which Thorpe House on exclusive Upper Braddons Hill Road, built in the 1850s, was one of the most important. The house needed substantial repair when its present owners moved there from London a few years ago and set about restoring it. Now for sale through Strutt & Parker at a guide price of £1.15m, Thorpe House has four reception rooms, two kitchens, eight bedrooms and four bath/shower rooms, plus a stone outbuilding and a greenhouse, set in four-fifths of an acre of wooded gardens. It also falls within the catchment area of sought-after Torquay Grammar School, one of few still operating in the county. It’s probably no coincidence that the reappearance of the London buyer has brought some intriguing trophy coastal properties to the open market for the first time this year. ‘Location, location’ is the obvious basis for the £3m price tag quoted by Knight Frank for the extra-ordinary Viper’s Quay at Dittisham on the Dart. Built by the current owner’s father in the 1960s on the site of an early 19th-century boat house, secluded Viper’s Quay sits literally on the water, surrounded by dense woodland. It has open-plan living accommodation, five bedrooms and four bathrooms, with planning consent to extend, but its true value lies in its rare deep-water mooring and picturesque tidal boathouse. Not to be outdone, Savills quote a guide price of ‘excess £3.5m’ for Old Vinery (Fig 5) at Salcombe, south Devon, which has planning consent to build a palatial new 6,000sq ft house on one of the finest sites to be found anywhere on the estuary. The existing five-bedroom house was designed by Elizabeth Jennings RA, and built in the 1960s in the grounds of Woodcot, the family estate bought by her grandfather, Andrew McIlwraith, in 1906. As yet, the London diaspora has not quite made it to deepest west Devon, where one of the area’s finest late-19th-century manor houses, Hurlditch Court at Lamerton, four miles from Tavistock, is on the market at a guide price of £2.35m through Jackson-Stops & Staff (01392 214222). Built on the site of an earlier, pre-Elizabethan manor, imposing, nine-bedroom Hurlditch Court has wonderful formal gardens, cottages, outbuildings and some extensive equestrian facilities, 70 acres in all, with dramatic views across rolling farmland to Dartmoor. North Devon tends to do its own thing, but it took Home Counties enterprise to transform rundown Downe House on the beautiful Hartland peninsula, 15 miles west of Bideford, into a charming, six-bedroom family house, with a thriving holiday cottage and spa business created in some former barns. Now, the present owners are cutting back, and six-bedroom Downe House, listed Grade II, with two cottages and the spa complex, is for sale through Jackson-Stops & Staff (01271 377833) at a guide price of £1.65m. There is also planning consent to add a swimming pool, a gymnasium and additional treatment rooms. ‘Previously, the nearest you would’ve got to a spa in this part of Devon would have been a seaweed bath in a rock pool,’ laughs selling-agent Nigel Colebrook.